Whether your fridge is on the fritz or it’s time for a brand-new kitchen altogether, getting rid of old appliances isn’t always an easy task. Appliances are big, bulky and made of materials that tend to make their removal difficult and costly. If you’re wondering what to do with an old appliance, check out the appliance removal, recycling and donation options below. 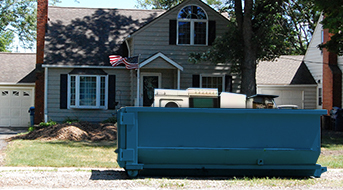 A roll off dumpster is an easy way to get rid of appliances and other junk from around the house. Simply load your items into the bin and call back when you’re finished to have it all hauled away. Plus, you can hang onto your container for as long as needed to finish your project. Since you can also use a roll off dumpster to throw away other items along with your old appliances, this option is great for home cleanouts or kitchen renovations. Load your appliances at your own pace. No need to be home for pickup. Rate is provided before your rental even arrives. Best for removing multiple or extremely large appliances. You load your own items. Dumpster sizes, weight limits and restrictions can vary by location. The easiest thing to do with an old appliance is to leave it at the curb, so see if your city offers collection and recycling services for large appliance disposal. You likely will have to schedule your appliance removal ahead of time and pay a moderate fee in addition to your usual trash bill. This option is not available everywhere, so be sure to contact your local municipal waste collection agency or the department of public works for more information on what to do with your old appliance. Simple, low-cost appliance disposal option. Great for removing one or two items. Offers a scheduled removal of your appliance. Some cities do not accept appliances for disposal or recycling. Pickups may be limited to certain days or times. You may have to drop off your appliance at a designated disposal location. Not ideal for removing multiple appliances. If you have just one or two appliances to get rid of, you could list them on Craigslist or Freecycle. Locals who collect scrap metal may be willing to pick up your old appliance for free, but if you really need it gone, you could always offer to cover the cost of gas. This option is ideal if you have a space to keep your old appliance until it’s claimed. Low-cost or free appliance removal option. Very little extra work involved. Not a guaranteed removal option. Can’t wait around for someone else to remove your old appliances? Take matters into your own hands and dump them yourself. You can dump appliances at most landfills or transfer stations, usually for a fee. Refrigerators and other cooling units may need to have refrigerants drained prior to dumping, though most facilities will handle this step for you. Finally, for safety reasons, make sure that your items are properly strapped down before hauling them away. You can get rid of the appliances on your own time. Affordable way to remove one or two items. Appliances can become a hazard while driving if not properly strapped down. Local landfill, transfer station or scrap yard may be far away. Could require multiple trips to remove all items. Some landfills may require that you remove or tape appliance doors shut prior to dumping them. This saves space by making the appliance as compact as possible. Check with your local dump for more information before dropping off your old appliances. Most junk removal companies will accept old appliances for either recycling or disposal. This option is great for getting rid of one or two hard-to-get-rid-of items. But if you’re throwing out more than that, you may want to look into other options, as their prices are determined by how much space your items take up. If you also have household clutter or renovation debris to remove, junk removal costs can add up quickly – research junk removal options and pricing near you before enlisting their services. Items are loaded up for you. Offers a scheduled removal of your appliances. Better for disposing of one or two items. Won’t receive a quote until the truck arrives. Price increases with each item. How many items you’re getting rid of. Whether you’re replacing an old appliance with a new one. The kind of appliance you’re getting rid of. We’ve broken down the costs of a few different appliance disposal options to help you choose the right one for your junk removal project. If you’re in the process of a major home cleanout or renovation, it may be more cost efficient to hire a junk removal service or rent a dumpster to get rid of old appliances. Generally, a junk removal service can take one or two items for around $150, but removing a half truckload of junk costs around $360 and a full load is around $550. Renting a dumpster typically costs $369 on average, with a minimum landfill appliance charge costing around $30 per item. Junk removal services charge by the volume of items inside their truck – the more space your items take up, the more expensive their services. Keep this in mind if you’re throwing out more than just appliances. With a dumpster rental, you can fill the entire container for a set price, with no additional fees for the other household junk you’re throwing away. If you’re just getting rid of just a fridge and a stove, a junk removal service may be your best bet. But if you also have other junk to dump, a dumpster rental is going to be the most cost-efficient appliance disposal option for your project. Best Buy: $19.99 when a replacement appliance is purchased and delivered. Standalone pickup is $99.99. Lowe’s: $20 haul away fee is included with the cost of installation for a new appliance. The Home Depot: Free appliance removal with the purchase and delivery of a new item. Sears: $25 to remove an old appliance with the purchase of a new item. If you’re just getting rid of one appliance and not replacing it, the cost of removal can vary depending on the item. While it may cost nothing to throw out your old microwave with your weekly trash pickup, it could cost up to $150 for a junk removal company to take away your old chest freezer. When in doubt, call the junk service, landfill or recycling station for a quote on your individual appliance’s disposal. If your city offers recycling, they will typically offer recycling stations for large appliances at a local transfer station or dump. Most locations provide a list of accepted appliances and the price to dispose of them online, so do a quick search to learn more about options near you. You could also try to make a little money off of your old appliance by hauling it to your local scrap metal dealer. Most metal recyclers will accept appliances for sale as scrap, making this a great way to get rid of appliances for free. Most retailers aren’t just tossing the appliances they haul away for you. If you’re in the process of replacing an old appliance, do a little research on which retailers recycle appliances before making your purchase. Your utility provider may offer an appliance recycling program. Some organizations offer this in conjunction with the EPA’s Responsible Appliance Disposal program and may provide free pickup and pay an incentive. If you have trouble finding local resources for recycling large appliances, use Earth911’s recycling database to locate recycling facilities near you. If your appliance doesn’t have any major problems, you can simply donate it. In fact, many charities offer appliance pickup for no charge, making this a great way to get rid of old appliances for free. Just be sure that your items can be accepted at your local charities. Some, like Goodwill, generally cannot accept large or bulky appliances. Is in good, working condition. Can be used as is, with no repairs. Is clean and free of bugs or other pests. Can I rent a dumpster to dispose of appliances in my area? We accept large appliances for disposal in many of our service areas, but disposal regulations vary by location. Some cities may prohibit the disposal of ovens, refrigerators, dishwashers and other appliances in landfills. Air conditioners and refrigerators with Freon may not be accepted in some areas. Our customer service team can answer this question about your location. Call us now to find out. Can I mix other items with appliances in a roll off dumpster? Yes, you can mix most other household junk items with appliances in your dumpster so long as they are accepted in your area. This is why a dumpster rental is ideal for disposing of appliances during a big home cleanout. There are, however, certain prohibited materials that can never be disposed of using a dumpster. Make sure to keep these items out of your bin at all times. Are there any fees for disposing of an appliance in a dumpster? Local landfills and transfer stations may impose additional fees for handling and processing large appliances. This fee applies whether the appliance is delivered directly to the landfill, left on the curb or hauled over in a dumpster. Why do refrigerants need to be removed from freezers and fridges? Refrigerators and freezers built before 1995 contain chlorofluorocarbon (CFC) refrigerants (commonly known as Freon). These substances are ozone-depleting chemicals that destroy the ozone layer and are also powerful greenhouse gases. Improper disposal of CFCs can present a danger to the environment. Modern cooling units use ozone-friendly hydrofluorocarbon (HFC) refrigerants, but even these must be drained carefully, as they are considered greenhouse gases. In most cases, the recycler or landfill handling your appliance disposal will drain the refrigerants themselves. But if you are responsible for draining your fridge or freezer prior to disposal, find a certified refrigerant reclaimer to do it.